* Weekly Discount. Stay 7 nights get one free. Pay for 6. * A one time $75 per cabin or $250 lodge cleaning fee will apply. Rental Forms / Terms and Conditions Here. Cabins will sleep 2 to 4 adults comfortably and up to 6 people depending on the cabin. Lodge sleeps up to 12. Week long and multi cabin / group discounts available. Contact us for more info. Please check in after 4:00 pm. Check out is 10:00 am. Let us know if special arrangements can be made to fit your schedule and we will be happy to help. all local waters as available. Full day trips include picnic lunch or supper, snacks, water and soft drinks. 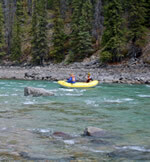 All guided trips include any equipment that you might need, shuttle, and transportation from and to the Fly Shop. Flies, leaders and other gear can be purchased at the Fly Shop. Fishing licenses should be purchased on line ahead of time here. Contact us for more info. Rental Forms Here. * Complimentary for cabin guest use. All of the above prices are self shuttle / you tow 2" ball trailer. Valid picture identification and a major credit card are required for any rental at KRO. Reservations are first come first serve. Please plan ahead. Renter is responsible for equipment. Beyond normal use...if you trash it, break it, lose it, etc....you will pay for it. Period. EVERY renter must also sign an equipment rental agreement and liability release. You are also responsible for your own as well as your passengers safety. There are inherent risks involved with the equipment that you will be using. By renting this equipment you acknowledge that you are voluntarily assuming those risks including serious injury or death. 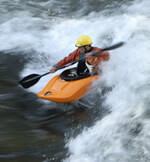 Make sure you know your limits including physical condition, water conditions, time allotted and weather. Terms & Conditions - Rental Forms - Where appropriate please print these out, sign and either return or bring with you as we are required to have them. It will save time when you get here if we already have them on file. 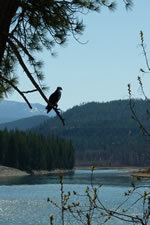 Terms and Conditions: A 50% deposit is required to confirm your lodging and /or fly fishing reservation. The balance is due upon or prior to arrival, payable by check or credit card. Due to the nature of our business for in season Memorial Day Weekend - 10/1, Thanksgiving weekend, and 12/20 - 1/1 canceled reservations, NO REFUNDS will be given. However you may reschedule and apply your full deposit to any future trip with us that year provided space is available. Off season your deposit is refundable up to 60 days before your scheduled arrival date. A $100 cancellation fee will apply. We recommend purchasing travel insurance to cover unexpected illness, travel issues or emergency. 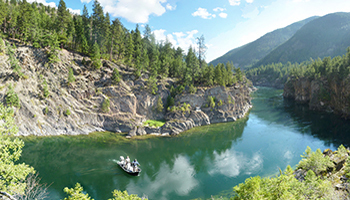 Kootenai River Outfitters is licensed by the Montana Board of Outfitters and operates under permits from the Three Rivers Ranger District of the USDA / National Forest Service. Our goal is to ensure that your experience is exceptional. Please let us know if there is anything that we can do to make your visit to Northwest Montana more enjoyable. We reserve the right to cancel any trip because of weather / water conditions. In this very rare occurrence we will either refund that portion of the trip or apply it to any future trip with us.